Background Fibroblast growth factor-23 (FGF-23) has been hypothesized to play a role in the increased risk of cardiovascular disease in patients with CKD. 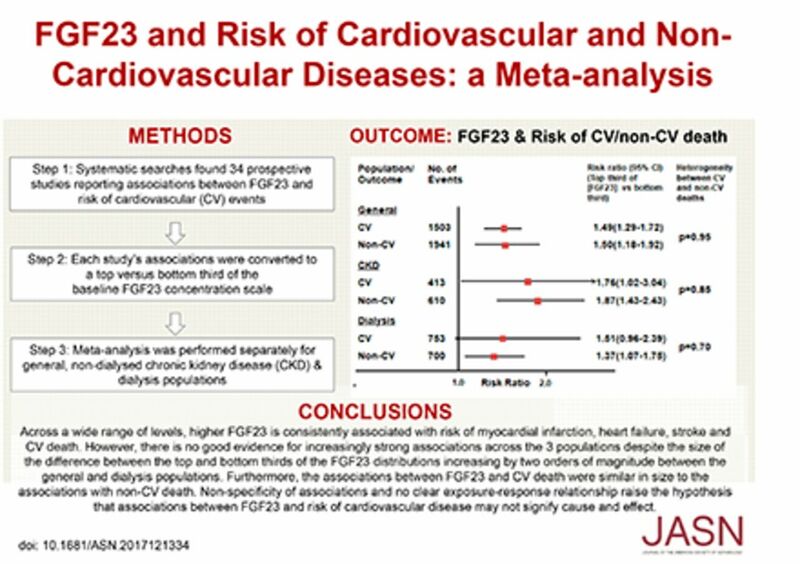 Methods We identified prospective studies reporting associations between FGF-23 concentration and risk of cardiovascular events. Maximally adjusted risk ratios (RRs) were extracted for each outcome and scaled to a comparison of the top versus bottom third of the baseline FGF-23 concentration, and the results aggregated. Results Depending on the assay used, median FGF-23 concentrations were 43–74 RU/ml and 38–47 pg/ml in 17 general population cohorts; 102–392 RU/ml in nine cohorts of patients with CKD not requiring dialysis; and 79–4212 RU/ml and 2526–5555 pg/ml in eight cohorts of patients on dialysis. Overall, comparing participants in the top and bottom FGF-23 concentration thirds, the summary RRs (95% confidence intervals [95% CIs]) were 1.33 (1.12 to 1.58) for myocardial infarction, 1.26 (1.13 to 1.41) for stroke, 1.48 (1.29 to 1.69) for heart failure, 1.42 (1.27 to 1.60) for cardiovascular mortality, and 1.70 (1.52 to 1.91) for all-cause mortality. The summary RR for noncardiovascular mortality, calculated indirectly, was 1.52 (95% CI, 1.28 to 1.79). When studies were ordered by average differences in FGF-23 concentration between the top and bottom thirds, there was no trend in RRs across the studies. Conclusions The similarly-sized associations between increased FGF-23 concentration and cardiovascular (atherosclerotic and nonatherosclerotic) and noncardiovascular outcomes, together with the absence of any exposure–response relationship, suggest that the relationship between FGF-23 and cardiovascular disease risk may be noncausal.